Making: banana bread. Mia keeps asking for it, (she’s been ‘making’ her own in the playroom with lego, textas and old banana skins (eeew), for the past week) and I’ve found a gluten-free recipe that’s got the thumbs up from the whole family (rare). The only problem with it is that it disappears in one sitting so that’s a whole lot of effort and mess for a non-baker to go to for fairly minimal payoff! Cooking: the same old stuff every single week. Cooking is soooo boring to me and I’ve given up trying to find recipes that are different, nutritious and meet the various allergy needs of this house (one dairy intolerant, one gluten intolerant, one anaphylactic nut allergy) not to mention the general fussiness of the eaters in it (Ant doesn’t do vegetables, the kids don’t eat anything that’s not a white carbohydrate). This is why I just revert to roast meat/chicken + veggies more often than not. But hey, I’m also very open-minded. If you have a killer recipe that the whole family will love, contains no gluten, dairy or nuts, and can be prepared in less than 20 minutes before chucking in an oven or slow cooker … please, share it with me! Drinking: sooooo many cups of tea since I gave up coffee. Reading: A Little Life by Hanya Yangihara. It’s slaying me. The writing is stunning. The characters are beautifully drawn. The subject matter is … harrowing. I don’t want it to end, but I need to get to the end so that, one, I can get some sleep and, two, I can go and debrief with others who’ve read it. Wanting: a seven hour block of time where I’m completely alone and can sit in silence at my computer and not have to talk to anyone. Why seven hours? Because that’s how long it takes for this little INFJ to truly re-charge. I won’t even go into how I know that. Much less how lame it is that 5-6 hours is not enough, no, I need seven. Playing: with the design of my website. Deciding: where to focus my efforts at the moment. I have a lot of things putting their hands up for my attention and as much as I’d like to, I can’t do them all. Wishing: I was fit enough to contemplate doing this Half-Marathon next month. Ah, if wishes were horses. Enjoying: how well my kids are getting along at the moment. Waiting: for our house to finish building. It’s five months overdue and I’ve gotten to the point of ‘we’re never going to get in there’. Liking: this post from Katrina Chambers. I love anything that shows that tiny tweaks can make a big difference. Wondering: when my footy team is going to win a game this season. 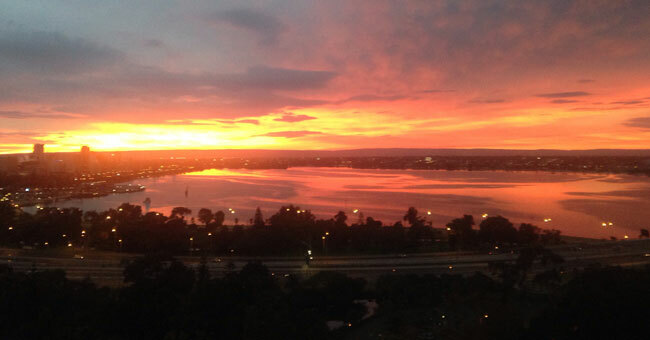 Loving: the sunrises we’ve been having here in Perth. I am catching so many of them because the sun is rising in the middle of my morning runs/walks. Considering: a rescue dog. Mia loves dogs and we’ll be well-placed to get one when we move in to our new place. Buying: not much right now. Am saving up for when our house is finished. Watching: House of Cards. We’re two episodes into Season Four and frankly, those two episodes have been a bit boring! But I can see they’re setting up for something big. Cringing: at the fact Australia is about to have another federal election where we’re going to vote for the ‘least worst’ option. Questioning: the amount of time I let Jaden spend playing Minecraft. It’s a godsend during school holidays when I’m trying to work … but it’s still a lot of time to spend on an electronic device. Smelling: coffee and not craving it. This is mind-blowing to me. Wearing: my favourite black soft pants. They are so comfy, yet can be worn in public (although my mum might disagree). The perfect combo! Following: Constance Hall. I only came across her when she did this for Rafiki Mwema. Where have I been? Noticing: that my aversion to mess is getting greater as I get older. Knowing: this is not the greatest thing in the world when you have kids. Admiring: the cover of my friend Anna’s new book. Cannot wait to read it. Sorting: out the kids’ toys and giving them all away because seriously, other than Lego and drawing/colouring in – they don’t play with toys. So they don’t need them right? Disliking: how genuinely distressed I am at the thought of a whole weekend without my phone. Bookmarking: pretty much everything Ellen Jackson shares on Facebook. Coveting: um nothing I can think of. Giggling: at the conversations coming from the back of the car when my son had a couple of friends over this week. It’s been all poo, bums and fart. Boys! Feeling: discombobulated. School holidays always does that for me. But also, this week was the 10 year anniversary of the death of a close friend and I hate that his friends, family, and the world in general has been without him for 10 years. Ripped off. Hearing: the laughter of my kids as they mess around with Ant in the afternoons. Our current work/life setup means we’re getting some really great family time at the moment and this just makes me so happy. How’s life for you right now?